<h2>‘Good chance’ of success in dark matter hunt</h2><br /><p>After successfully finding the Higgs boson – dubbed the God Particle by the media for its role in filling an important hole in the so-called Standard Model of particle physics – in 2012, the LHC has turned its attention to the hunt for dark matter.</p> <p>Yet, so far, the 27-kilometre particle accelerator that straddles the frontier between France and Switzerland just north of Geneva has drawn a blank.</p> <p>The chances are that it is just a matter of narrowing down the probabilities, according to Professor Paraskevas Sphicas, a senior researcher at CERN, the European Organization for Nuclear Research, which operates the LHC.</p> <p>‘The more we run, the smaller the probability of interaction between dark matter and standard particles that we can probe,’ said Prof. Sphicas, likening it to holding a lottery ticket.</p> <p>‘If the number of lottery tickets that we have sold is extremely large, say 10 billion, if you are going to hope that we can get anything, you’d need to wait until we have something around 10 billion draws, 10 billion interactions,’ he said.</p> <p>‘If your probability of occurence is smaller than 10 billion, say a trillion, you’ll have to wait until we accumulate close to or a bit more than a trillion lottery draws.’</p> <p>In fact, the LHC is expected to continue producing data for the next 20 years, much of that at 10 times current beam-intensity levels following an upgrade that is expected to be operational in 2025.</p> <p>‘Essentially the LHC will cover a big chunk of this possibility space,’ explained Prof. Sphicas. ‘One can certainly not speak with certainty, (though) I think we have a pretty good chance of getting some signal out.’</p> <p>He is part of the AMVA4NewPhysics project, which is using funding from the EU’s Marie Skłodowska-Curie actions to train PhD students in using advanced multi-variate analysis, a new machine learning technology which can be used to interpret the vast amounts of data thrown up by the collisions at the LHC.</p> <p>‘This enables one to invest a significant amount of time, three years, in seeing how effective the latest, greatest in advanced multi-variate techniques can help in the analysis of LHC data,’ said Prof. Sphicas.</p> <p>That’s significant because data analysis represents the real heavy lifting in the search for dark matter, sifting through all of the recorded collisions to search for evidence for a possible dark matter particle.</p> <p><strong>Visible mass</strong></p> <p>Physicists have deduced the existence of dark matter by looking at the discrepancy between the visible mass of galaxies, and calculations of mass based on the motion of galaxies, taking into account the effects of gravity.</p> <p>The problem is that the force of gravity is so tiny that it is impossible to detect at the level of a single particle, meaning that it can’t be used as a way to find dark matter. The work at the LHC is to see other ways in which dark matter might react.</p> <p>‘It would be very strange if we have something that interacts only gravitationally,’ said Prof. Sphicas. ‘It’s got to have some other property, it has to have some connection to the rest of the universe.’</p> <p>It means the door is still wide open to the possibilities of dark matter, and it could be that physicists are looking in completely the wrong place.<br /> <div class="quote-view quotesBlock quote_vertical_right"> <div class="quotesTop"><img src="https://horizon-magazine.eu/sites/all/themes/horizon/images/quotes_top.png" alt="" title="" /></div> <p>‘It’s got to have some other property, it has to have some connection to the rest of the universe.’</p> <blockquote><p>Prof. Paraskevas Sphicas, senior researcher, CERN</p></blockquote> <div class="quotesBottom"><img src="https://horizon-magazine.eu/sites/all/themes/horizon/images/quotes_bottom.png" alt="" title="" /></div> </div> </p> <p>Nothing is confirmed yet, but there have already been some anomalies that deviate from the Standard Model at one of the experiments being carried out at the LHC, known as LHCb, which is looking at the differences between matter and antimatter.</p> <p>‘It could be known physics, producing some effect we did not predict precisely enough, or it could be new physics,&nbsp;or just a statistical fluctuation,’ explained Dr Adrián&nbsp;Carmona, a theoretical physicist from the south of Spain&nbsp;who has received funding from the EU’s Marie Skłodowska-Curie actions to work at CERN as part of the NP4theLHC14 project.</p> <p>‘But, if we discover that it is due to new physics, it would be very exciting and it might also tell us something about dark matter,’ said Dr Carmona.</p> <p>He is trying to understand these deviations as part of his role as a model builder – one of the physicists who must come up with new models and make predictions that the experimental teams at CERN test.</p> <p>‘It could be that this is also the door to a new theory explaining also why we have so little visible matter in the universe,’ he said.</p> <p>However, there’s always the possibility that these efforts will be in vain and the LHC will never find the dark matter particle.</p> <p>‘Personally, I don’t believe that the LHC experiment will find a particle (that is) dark matter, I think the answer lies somewhere else,’ said Dr Tommaso Dorigo, a multi-variate analysis specialist at the National Institute for Nuclear Physics in Italy who is the coordinator of the AMVA4NewPhysics project.</p> <p>‘Yet, we must continue to search. Only when we have completed the possible parameter space where this particle may reside will we be able to say, “It is not a particle, dark matter must be constituted by something else, maybe black holes or who knows what.”’</p> <br /> <img src=”http://www.google-analytics.com/collect?v=1&tid=UA-40077089-1&cid=‘good-chance’-of-success-in-dark-matter-hunt&t=event&ec=republish&ea=read&el=‘good-chance’-of-success-in-dark-matter-hunt&cs=republish&cm=republish&cn=republish&cm1=1" /> This post <a href="https://horizon-magazine.eu/article/good-chance-success-dark-matter-hunt.html">‘Good chance’ of success in dark matter hunt</a> was originally published on <a href="https://horizon-magazine.eu/">Horizon: the EU Research &amp; Innovation magazine | European Commission</a>. 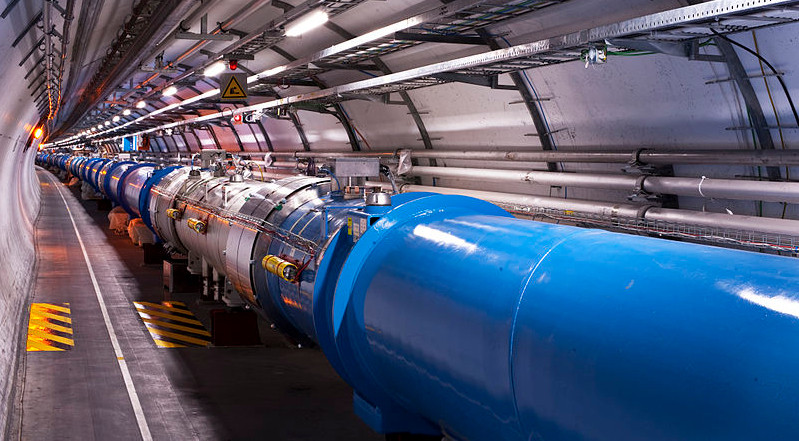 The Large Hadron Collider (LHC), the world’s biggest particle smasher, stands a good chance of discovering the elusive particle or particles, known to scientists as dark matter, that make up five-sixths of the mass of the universe, researchers say. After successfully finding the Higgs boson – dubbed the God Particle by the media for its role in filling an important hole in the so-called Standard Model of particle physics – in 2012, the LHC has turned its attention to the hunt for dark matter. What did Marie Skłodowska Curie ever do for us? Yet, so far, the 27-kilometre particle accelerator that straddles the frontier between France and Switzerland just north of Geneva has drawn a blank. The chances are that it is just a matter of narrowing down the probabilities, according to Professor Paraskevas Sphicas, a senior researcher at CERN, the European Organization for Nuclear Research, which operates the LHC. ‘The more we run, the smaller the probability of interaction between dark matter and standard particles that we can probe,’ said Prof. Sphicas, likening it to holding a lottery ticket. ‘If the number of lottery tickets that we have sold is extremely large, say 10 billion, if you are going to hope that we can get anything, you’d need to wait until we have something around 10 billion draws, 10 billion interactions,’ he said. In fact, the LHC is expected to continue producing data for the next 20 years, much of that at 10 times current beam-intensity levels following an upgrade that is expected to be operational in 2025. He is part of the AMVA4NewPhysics project, which is using funding from the EU’s Marie Skłodowska-Curie actions to train PhD students in using advanced multi-variate analysis, a new machine learning technology which can be used to interpret the vast amounts of data thrown up by the collisions at the LHC. ‘This enables one to invest a significant amount of time, three years, in seeing how effective the latest, greatest in advanced multi-variate techniques can help in the analysis of LHC data,’ said Prof. Sphicas. That’s significant because data analysis represents the real heavy lifting in the search for dark matter, sifting through all of the recorded collisions to search for evidence for a possible dark matter particle. Physicists have deduced the existence of dark matter by looking at the discrepancy between the visible mass of galaxies, and calculations of mass based on the motion of galaxies, taking into account the effects of gravity. The problem is that the force of gravity is so tiny that it is impossible to detect at the level of a single particle, meaning that it can’t be used as a way to find dark matter. The work at the LHC is to see other ways in which dark matter might react. It means the door is still wide open to the possibilities of dark matter, and it could be that physicists are looking in completely the wrong place. Nothing is confirmed yet, but there have already been some anomalies that deviate from the Standard Model at one of the experiments being carried out at the LHC, known as LHCb, which is looking at the differences between matter and antimatter. ‘It could be known physics, producing some effect we did not predict precisely enough, or it could be new physics, or just a statistical fluctuation,’ explained Dr Adrián Carmona, a theoretical physicist from the south of Spain who has received funding from the EU’s Marie Skłodowska-Curie actions to work at CERN as part of the NP4theLHC14 project. ‘But, if we discover that it is due to new physics, it would be very exciting and it might also tell us something about dark matter,’ said Dr Carmona. He is trying to understand these deviations as part of his role as a model builder – one of the physicists who must come up with new models and make predictions that the experimental teams at CERN test. ‘It could be that this is also the door to a new theory explaining also why we have so little visible matter in the universe,’ he said. However, there’s always the possibility that these efforts will be in vain and the LHC will never find the dark matter particle. ‘Personally, I don’t believe that the LHC experiment will find a particle (that is) dark matter, I think the answer lies somewhere else,’ said Dr Tommaso Dorigo, a multi-variate analysis specialist at the National Institute for Nuclear Physics in Italy who is the coordinator of the AMVA4NewPhysics project.